Particle contamination in lubricants has been identified as a major cause of premature bearing and gear failure. Various experimental and predictive methods have been developed to assist the design engineer in particle detection and analysis and in the development of equipment that is less sensitive to such contamination. New data comparing bearing life test results and predictive analysis methods for various tapered roller bearings operating under debris-contaminated conditions is now available. Recent work has refined one analytical method (using a surface characterization technique) and correlated this method with bearing test lives in debris conditions. Their work identified potential design and manufacturing modifications in the bearings and is aimed at making the bearings live longer in debris-contaminated environments. Much has been published concerning the predominantly detrimental influence of debris particle contamination on bearing performance.8,11 Many theories have been proposed concerning the manufacturing process, materials and metallurgical practices that can be used to optimize such performance. Most of these methods are based on techniques that determine the lubricant’s debris content rather than the damage inflicted on rolling contact surfaces. The inference of these methods is that if the contamination content of a lubricant system is understood, the damage levels on the components of the system will also be known. Based on the results from field testing, some precautionary conclusions are drawn about linking such lubricant analysis methods directly to life prediction. Accordingly, a new life prediction model using direct surface characterization has been developed. This model is an extension of prior work12,13 that combines a stress-based analytical procedure with a debris dent surface mapping procedure to more accurately capture the actual debris damage incurring in a particular debris environment. 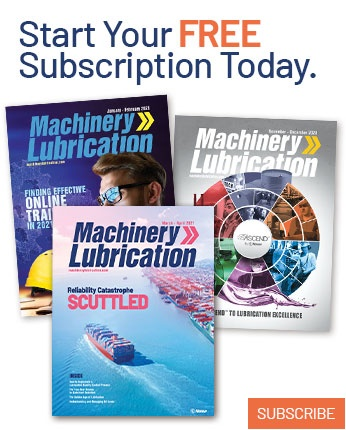 Equipment design engineers currently have many contaminated lubricant analysis tools to help them assess the detrimental effects of debris particles on machinery wear. These existing analysis tools allow them to conduct wear particle and contamination analysis by ferrographic methods,1 gravimetric filtration methods,2 atomic absorption spectroscopy3 and by coupling scanning electron microscopy (SEM) with energy dispersive X-ray analysis (EDAX),4 all of which are aimed at understanding the material make-up and characteristics of particle contamination. In addition, particle size distributions and concentration levels are sought by particle sizing and counting techniques. Such methods use both manual microscopic methods, as well as automatic direct counting through equipment using light-scattering methods.5 Most of the analysis tools just mentioned are used to monitor and understand the evolution of equipment failure, as well as the level of lubricant contamination for predictive and preventive maintenance. The ISO 4406 rating method is a popular method used to describe contamination levels. Many seek to use this rating method and link it directly to performance prediction. While these techniques and methods are useful in understanding wear mechanisms and wear rates, they do little to help evaluate the impact debris has on finished gear and bearing surfaces as it relates to material fatigue life. A direct method, using surface damage characterization, has been developed for assessing the detrimental effect of debris-contaminated lubrication environments.6 It seeks to provide a practical approach to determining contamination effects and is appropriately labeled Debris Signature AnalysisSM. The following field study is an example of the advantage that such a surface characterization method might provide in evaluating in-service components. In cooperation with an equipment manufacturer, field testing was conducted by sampling lubricant systems at appropriate service periods. The standard method for determining particle size distributions and concentration levels was used to monitor contamination levels in an actual customer field application. Bearings from these field units were removed from service after an extended period. These bearing surfaces were examined, both visually and by the surface characterization method, for debris damage to quantify the damage levels. Table 1 shows a few typical particle size distributions and concentrations observed through the period of service by the equipment. Figure 1 shows a typical visual appearance of some of the bearing load carrying surface after the same period of service. It was quite evident in just these visual comparisons alone that the lubricant analysis did not illustrate the level of surface damage that might be expected. By comparing the data in Table 1 to the damage seen during the visual inspection, it is clear that the lubricant sampling did not predict any particles much greater than 300 µm. However, the visual comparison of dents, some on the order of 6 mm in diameter, indicates the presence of huge particles on the order of 100 times larger than the 300 µm particle from the lubricant sample. The Debris Signature Analysis method was used to more accurately characterize the surface damage by the detailed method developed.6 This method of direct surface analysis indicated a 42 percent life reduction, while the lubricant analysis results did not indicate major detrimental effects. In addition, the surface analysis results correlated better with actual field performance. This example serves to illustrate the need for surface characterization in linking performance to contamination damage. 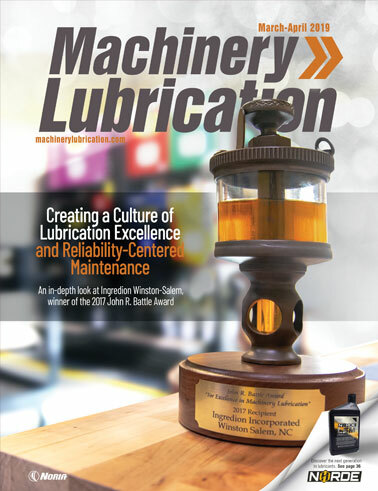 It was concluded that lubricant analysis alone might not be a reliable method for linking bearing damage and resulting field service, at least not for heavily contaminated systems. As part of the evaluation process for assessing and predicting bearing performance under conditions of debris contamination, numerous bearing life tests were conducted. For these comparisons, a standardized method for debris damage was used.7 Tested bearings were pre-dented and no additional debris was added during these tests. In Figure 2, the performance comparison for five major tapered roller bearing manufacturers is shown. This testing was previously reported11 and was performed on what is considered to be standard product, manufactured with the conventional process common to each given manufacturer. The results within this group varied by a factor of about three with Bearing A having the highest relative performance. Bearings B and E were manufactured with through-hardened material and processing. Bearing A, as well as Bearings C and D were manufactured in part or completely of case carburized components. For statistical comparison purposes, the life test results are shown bracketed with 65 percent confidence bands. The band’s width is calculated based on the sample size and scatter of testing failures and is a function of the Weibull slope. When such bands overlap between test groups, no statistically significant difference in performance can be claimed at the 90 percent confidence level. Comparative debris damage testing of special bearing products was performed (Figures 3, 4 and 5). This life testing compared the conventional product from one manufacturer (Bearing A) to that of special debris-resistant products from two other manufacturers. Here, the special debris-resistant products were claiming up to 10 times life improvement over conventional processes. Three separate tests were performed (Figure 3 = test No. 1, Figure 4 = test No. 2, Figure 5 = test No. 3). The test conditions and bearings varied between these separate tests. Figure 3. Life Test Comparison of a Conventional Process vs. Figure 3 shows the normalized results for debris damage testing with conditions identical to Figure 2.7 This shows that Bearing A, using a conventional process by one manufacturer, had life test results that slightly exceeded the results of another manufacturer’s special debris-resistant process. Figure 4. Life Test Comparison of a Conventional Process vs. Figure 4 shows the normalized life test results for debris damage testing with conditions similar to that of Figure 2, except the debris media was changed. This resulted in only light debris damage. Here, Debris Signature Analysis was applied to conventional Bearing A, and predicted only threshold life reduction due to debris. Under these conditions, Bearing A, using a conventional process by one manufacturer, had performance results that were equal to the results of another manufacturer’s special debris-resistant process. Figure 5. Life Test Comparison of a Conventional Process vs. Figure 5 shows the normalized results for debris damage testing with a large, 318 mm OD bearing. A different set of life testing conditions was applied, as was a new debris media and a new method to apply the debris media. These changes were caused in part by the use of the larger test bearing. This resulted in moderate to severe debris damage. Debris Signature Analysis was applied to conventional Bearing A and predicted up to a three times life reduction. Under these conditions, Bearing A had life test results that significantly exceeded the results of another manufacturer’s special debris-resistant process. One conclusion from this testing is that differences in the manufacturing process, materials and metallurgical practices used in bearings produced by different manufacturers impact fatigue life of bearings operating in high-debris environments. By studying the unique metallurgical design and processing parameters used to produce Bearing A, an improved debris-resistant approach was developed. The goal was to enhance the bearing’s strength, ductility and toughness, particularly at the functional contact (raceway) surfaces. The approach included changing to key design specifications and tightening the control limits process for select parameters, particularly during heat treating. A statistically significant improvement in performance was ultimately accomplished (Figure 6). The proprietary specification involves select parameters including material chemistry, retained austenite, microstructure and post heat-treat control of near surface properties. The performance results of this new debris-resistant design and processing approach are shown in Figure 6. The life testing shown was performed on a midsized, 248 mm OD bearing, where considerable life testing experience was previously established. Figure 6. Life Test Comparison of Debris-resistant Bearing vs. In this particular test, the lives of two debris-dented conventional baseline groups were approximately two to three times less than the predicted life with no denting. Debris Signature Analysis was applied and predicted a debris life reduction factor from 0.4 to 0.5 for these baseline bearings. The predicted results are illustrated in Figure 6. The debris-resistant bearing performed much better than the baseline groups, with its upper 65 percent confidence band crossing the line for predicted life with no debris damage. Thus, for the given testing severity, the new debris-resistant bearing negated the effects of the given debris damage and increased mean population bearing life by up to 2.3 times more than the two baseline bearing groups made with conventional processing. This debris-resistant bearing provides up to two times life improvement in debris environments. The theoretical basis for the debris life prediction tool was presented by Dr. Xiaolan Ai in the section titled “Fatigue Life Reduction of Roller Bearings Due to Debris Denting: Part I - Theoretical Modeling” in the Tribology Transactions journal.12 The theory discusses the effects of debris dents on raceway contact stresses and determining fatigue life. The model was verified with controlled debris dent bearing tests using bearings with the performance characteristics represented by Bearing A. Because debris in applications covers a large range of particle sizes, a program was put together to determine the effect of lubricant contamination composed of realistic particle size distributions. Two approaches were used. The first approach simulated debris particle size distributions that correlate to ISO 4406:87 code distributions. Specifically, 52100 steel debris particle distributions for ISO 13/10, ISO 15/12, ISO 17/14, ISO 18/16 and ISO 21/18 were mixed with lubricant and used to dent bearings.7 The dented bearing surfaces were then optically mapped to obtain dent size and surface density distributions, thus obtaining a Debris Signature Analysis profile for each of these debris conditions. Data files containing dent sizes and surface densities were stored by application engineers for analyzing the life of bearings that might be operating in these environments. The second approach used bearings from actual applications in the field and optically characterized the sizes and surface density of dents on these bearings for future life analyses. These were larger bearings that generally operate in more heavily contaminated conditions. 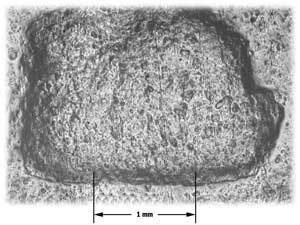 Photographs of these dented surfaces can then be used by engineers to select a level of raceway surface damage typically seen in their applications. The analysis of typical life test lubricants taken from standard life test machines has shown that the base cleanliness level is ISO 15/12. The debris life factor has a value of 1.0 at this cleanliness level. Cleaner lubricant would provide enhanced life and lubricant with more debris would give a reduced life. To determine a life reduction factor, the dent Debris Signature Analysis data files are used in the following manner. The rolling element contact loads are determined for application conditions to determine contact stresses and contact area. The effect of the size and number of dents on the life of the bearing in this environment can then be determined. Figure 7 shows a plot of debris life factors for a 33 mm bore tapered roller bearing for different lubricant cleanliness levels and radial loads in terms of percent C(90)* rating. At heavy loads, the effects of varying debris levels are reduced because the net effect on the general stress level is reduced as opposed to the greater effect on modifying the general stress level at light loads. Figure 2 shows that bearings made of through-hardened steel can be more sensitive to debris dents than bearings made of case carburized steel. Figure 6 shows that case carburized bearings can be made even more debris-resistant. Figure 8 shows the difference in model debris life factors for bearings made of these materials relative to case carburized bearings for a moderately contaminated environment. Bearings made of through-hardened steel will have a somewhat lower life than case carburized bearings. As might be expected, the debris-resistant bearing microstructure is more effective in improving bearing life in the more contaminated environments. A significant number of debris-dented bearings have been life tested in the authors’ life test machines. The correlation between the experimentally determined reduction in life due to debris dents and the life reduction predicted by this approach is shown in Figure 9.15 For the authors’ bearing product, this model has been shown to provide a practical connection between actual debris dents and subsequent fatigue damage. The following conclusions and observations are provided as a result of the analysis experience and experimental test results. For heavily contaminated systems, lubricant analysis methods alone might not be a reliable method for linking bearing damage and the resulting field service. Fatigue life testing of bearings to evaluate debris damage sensitivity can be a useful tool to differentiate product performance. Standardized life testing with debris showed that conventional and debris-resistant bearings from various manufacturers perform at significantly different levels. These differences should be considered when comparing the relative hierarchy of product debris resistance and when applying performance prediction tools. The direct measurement of damage method encompassed by Debris Signature Analysis is expected to provide more precision over other approaches involving lubricant contamination analysis in quantifying damage differences. Debris Signature Analysis should provide a tool for comparing, in a quantifiable way, the contamination environments of successful equipment performance to those that are not successful. The new life prediction model provides a practical connection between actual debris dents and subsequent fatigue damage. Anderson, D. P. (1995). Wear Particle Atlas (Revised). Predict/DLI, Cleveland, Ohio. Anonymous, (1996). Standard Test Method for Insoluble Contamination of Hydraulic Fluids by Gravimetric Analysis. ASTM D4898-90, ASTM, W. Conshohocken, Pa.
Glaeser, W. A., (1984, December). Use of Surface Analysis Techniques in the Study of Wear. Wear. (Vol. 100, No. 1-3). pp. 477-487. Ives, L. K. (1995). Electron Microscopy. ASM Handbook, Vol. 18, Friction, Lubrication and Wear Technology, ASM International, 1995. Poley, J. (1990, Vol. 46, No. 1). Oil Analysis for Monitoring Hydraulic Oil Systems, A Step-Stage Approach. Lubrication Engineering. pp 41-47. Cogdell, J. D. and Nixon, H.P. (1998, April 8-9). Debris Signature Analysissm: A Method for Assessing the Detrimental Effect of Specific Debris Contaminated Lubrication Environments. SAE Paper 981478, Presented at the Earthmoving Industry Conference & Exposition, Peoria, Ill. Cogdell,J.D., Nixon, H.P. and Zantopulos, H. (1994). A Standardized Method for Evaluating Debris Resistance of Rolling Element Bearings. SAE Tech. Paper Series 940728. Nixon, H.P. and Zantopulos, H. (1995, May). Fatigue Life Performance Comparisons of Tapered Roller Bearings with Debris-Damaged Raceways. Preprint 95-AM-3F-2, STLE, 50th Annual Meeting, Chicago, Ill.
Nixon, H.P., (1996, August 26-28). Assessing the Detrimental Impact of Lubricant Formulations and Debris Contamination on Tapered Roller Bearing Performance Characteristics. SAE Paper 961830. Presented at the International Off-Highway and Powerplant Congress and Exposition, Indianapolis, Ind. Fox, G.P., Martens, M.D. and Nixon, H.P. (1999, September 13-15). A Bearing Life Prediction Method for Utilizing Progressive Functional Surface Damage Analysis from a Debris Contaminated Lubrication Environment. SAE Paper 1999-01-2793. Presented at the International Off-Highway and Powerplant Congress and Exposition, Indianapolis, Ind. Ai, Xiaolan, Cogdell, J.D., Fox, G.P. and Nixon, H.P. (1999, September 13-15). Assessing and Predicting the Performance of Bearings in Debris Contaminated Lubrication Environment. SAE Paper 1999-01-2791. Presented at the International Off-Highway and Powerplant Congress and Exposition. Indianapolis, Ind. Ai, X. and Nixon, H.P. (2000). Fatigue Life Reduction of Roller Bearings Due to Debris Denting: Part I – Theortical Modeling. Tribology Transactions. (Vol. 43). pp. 197-204. Ai, X. and Nixon, H.P. (1999, October 11-13). A Bearing Life Prediction Model for Debris Damaged Rolling Element Bearing Surfaces. Presented at 1999 ASME/STLE International Tribology Conference, Kissimmee, Fla.
Ai, X. and Sawamiphakdi. (1999). Solving Elastic Contact between Rough Surfaces as an Unconstrained Strain Energy Minimization by Using CGM and FFT Techniques. Tribology (in press). ASME. Ai, X., (2001). Effects of Debris Contamination on the Fatigue Life of Roller Bearings. Proceedings of the Institute of Mechanical Engineers, Volume 215, Part J.